TechRepublic recently published an article that documents a growing fear among many IT pros that cloud adoption is putting their jobs at risk. The statistics from the article are compelling. 28% fear that cloud adoption is putting their career at risk. For some it's the lack of tools to manage cloud services, for others, it's the lack of knowledge to how to migrate workloads, or lead a cloud deployment that drives these fears. Most important of all, the fears are real. 40% of respondents note that their data center footprint shrink as cloud services take over of on-premises infrastructure. But there is hope. Cloud is bringing its own challenges, and those challenges provide career opportunities for IT pros willing to acquire the skills to meet those challenges. In this article, look at the challenges, and how cloud IT training is projection for your IT career. Vendor supplied training offered by Amazon on AWS, or Microsoft on Azure is perfect for getting a job in an organization that is running services on that platform or that has decided to move to that platform. Vendor neutral training like NCTA CloudMaster cloud computing classes and certifications, and CompTIA Cloud+ version 2 (due out in 2018) are much broader. They teach concepts, and critical cloud service, and provide comparison skills. They also teach skills like migration, multi-cloud integration, and how to protect your organziation from cloud vendor lock-in. If you're in an organization that is moving to a platform that offers training, take it. If you're part of the 50% of those in the Techrepublic article that don't know what tools to use to manage cloud, or part of the 37% that don't have the knowledge to migrate workloads, or part of the 31% that lack confidence to lead a cloud deployment, you should strongly consider vendor neutral training. NCTA CloudMaster gives you all of those skills, and hands on using the tools and platforms. Even more importantly, single cloud implementations are no longer the norm. More and more organizations are deploying to multiple clouds. Multi-cloud environments have a number of advantages; they also have several complex challenges and costs which, vendor neutral training prepares you to address. In fact, inadequate requirements identification and planning is why many cloud deployments fail. Having the skills to properly identify requirements, and critically compare cloud services and vendors will make you stand out with any organization moving to, or growing their cloud footprint. Getting a strong foundation in cloud IT training can help you stay employed and move up in your organization as IT services move to the cloud. 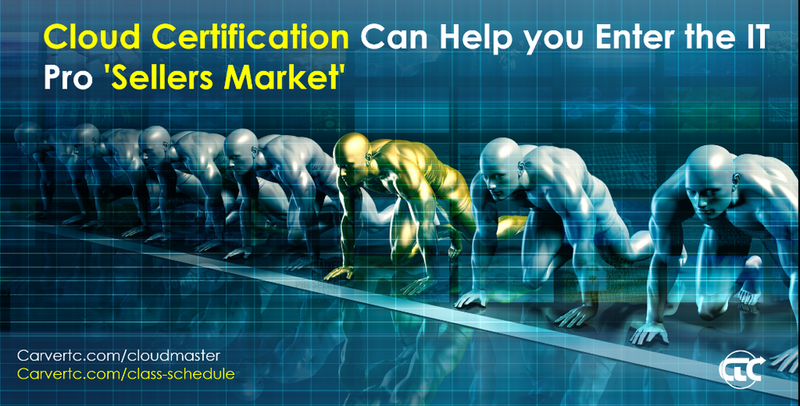 Getting comprehensive vendor neutral training and a premier certification such as Certified CloudMaster put you into a seller's market for cloud certified IT professionals. CarverTC offers CloudMaster cloud computing classes and certification preparation in Portland Oregon and across North America. "Pay is more a matter of how well an employee can negotiate a salary, than a matter of merit or talent." It's an unfortunate truth in many industries and seems to be very prevalent in IT for lots of reasons. But David makes the point that he's seen some in the IT world who were resistant to cloud being given promotions and put in areas of leadership, while genuine cloud promoters have been left behind. Unfortunately, we've seen the same thing in client's we've helped move to the cloud. Finally, David makes the point it doesn't have to be that way. In fact, this disruptive change in IT, this movement of services, and data to the cloud, can be a way for IT managers to adjust their organizations by promoting those with genuine vision, and who see the value of new technology. He gives two good approaches to help managers do that. But the question I feel many managers will be left with is, "How do I begin to vet my staff on how well they embrace the cloud?" I also feel that many IT have been asking that for some time, and, after David's article will do more soul searching over the question, "How do I stand out in this sea of change, and make this into a career opportunity." In this article, I'll provide some strategies to answer both of those questions. In my opinion how organizations and their employees answer that question is critically important because the shift to the cloud can make or break your IT team and career. "...use metrics for promotions and raises that value vision and innovation..." and "focus on value delivered by IT," specifically reducing costs, while increasing productivty and agility (all things cloud was made for). But how does an IT manager do that with an IT team that has its own hierarchy, either written or unwritten? One of the best ways to see who's interested in new technologies and innovative approaches is to offer training. Great training and certification programs are compelling to people who want to advance their career. They're very compelling to people who may feel stuck in the status quo. They aren't the IT stars today, but, training and certification can level the playing field. You can see who's interested in training, who goes, who follows up and gets certified, and who wants more. That will give you an idea who values vision and innovation. Then, you can use something you have way too much of, IT challenges and problems, to see who your new stars might be. You know what your IT challenges are. They probably range from small and annoying to problems that have been sitting in the corner of your whiteboard for so long they can no longer be erased. You likely have some you've tried to solve, but they keep coming back. Others you've had in the "too hard" box for far too long. Throw them out to your team. Have them put their new knowledge to work brainstorming solutions. Suddenly, the same small set of IT elders who always speak up in the IT all staff will be joined by a number of new voices who now have a grasp of how the cloud can solve your IT problems. Then you'll find out who understands the promise of cloud, and who can apply the capabilities and benefits of the cloud to solve your real problems. Simply put this is your chance to take advantage of this massive paradigm shift to Cloud and make it work to your advantage and move your career forward. Find out what training is available. If you see the direction your organization's IT is going, ask for training to help you get the skills you need to be a part of that transformation. If your organization hasn't made firm decisions on their IT direction yet, ask your manager what skills or new expertise he needs on the team, find training, and ask the organization to invest in you. You'll be a go-getter, and the training you'll get will be a win for you and your organization. We offer and recommend vendor neutral cloud training. Vendor specific cloud training such as that from AWS or Azure is great, once you have those systems. 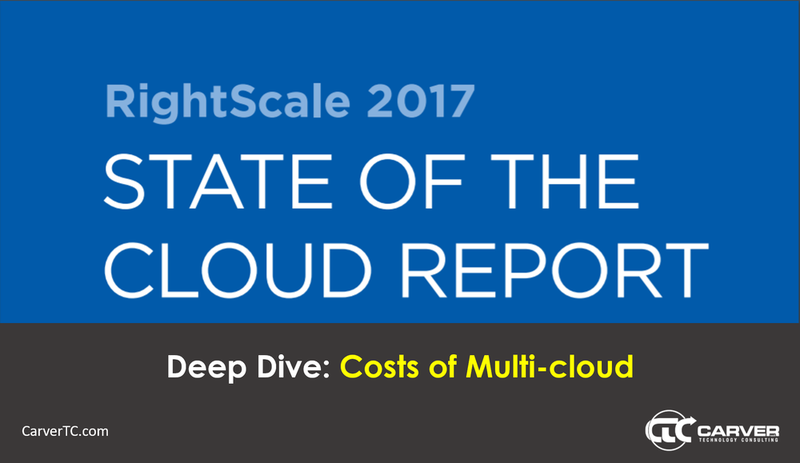 Most organizations today, have multi-cloud deployments. 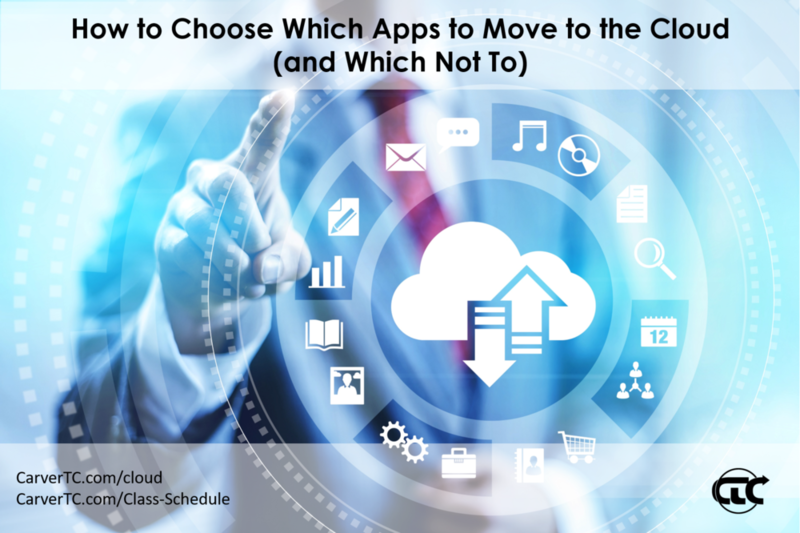 Having the skills and tools to properly evaluate and compare cloud services, and providers are essential to know what options you have for solving IT problems now, and what options you'll need to plan for once you're in the cloud. CloudMaster cloud computing classes are a comprehensive series that take students through planning, deployment, sysops, and cloud architecture design. They're all backed by certifications from the Nation Cloud Technologists Association. There's no better, or faster, way to get your team, or yourself, on a solid trajectory to make the most of this shift to the cloud. CarverTC offers Cloudmaster cloud computing classes and certification prep across North America. Success or failure of a cloud computing project, be it a simple SaaS implementation, or a complex legacy application migration, or anything in between will hinge on the technical knowledge, skills, and training of your IT staff. What many CIOs and aspiring cloud project managers don't realize is that winning approval to even start a cloud project can be one of the most difficult cloud computing tasks. Further complicating this is the fact that technical knowledge is not the most valuable asset in overcoming this cloud challenge. How you present the project, how you sell it, is the secret sauce for getting cloud projects approved. We wrote a popular article on this topic a little while back, but we decided to summarize the key points in this video. Enjoy! Tam Harbert recently wrote a good article in Computerworld where she detailed the different approaches five enterprise organizations are taking to upskill their IT staff to prepare for the cloud and other 'future IT' projects. The goal of the article was how organizations skill up their existing staff for cloud, and when they should hire fresh. Since we consult on cloud strategy, planning, and implementation, provide IT staffing, and offer cloud computing training, we see three different perspectives on this issue. We felt these four of these approaches deserved further analysis based on our experience. In this article, we're going to examine four of the ways described to get the skills needed for cloud IT projects. We'll talk about the benefits, and risks of each based on our experience, with the goal of helping you decide which approach, or a combination of approaches might be best. We've written extensively on our blog about the skills gap related to cloud IT. We've talked about how cloud security is one of the most difficult to find tech skills in 2017, and we pointed out how controlling costs is the most pressing challenge for organizations as they move from initial cloud adoption to having a mature integrated set of cloud services. We've shared many more articles that point to the difficulty in finding IT professionals with cloud skills. In summary, there's a skills gap, and that makes it challenging to find people to staff cloud IT projects. Ms. Harbert takes a look at the issue from a different perspective. Organizations have IT staff, why not skill them up and solve your skills gap problem with the people you already have? She quotes a 2016 TEKsystems survey that explains this different set of challenges. The survey stated that "68% of respondents think it's more challenging to staff IT projects today than five years ago." Further, only half "(53%) have a strategic plan for their workforce, and most (74%) of those plans are held by managers or directors rather than upper-level management," which means they might not get real or consistent traction in the organization. Even more telling was the that "73% reported that they only start planning for the workforce for a project within 90 days of needing the staff." "There’s a desire to be more strategic, but there’s a struggle in how to actually make that happen." Many of you might be nodding a little at this point. You'd like to be proactive, but you aren't. Why not? We've pressed hard on this question for some of our clients and a lot of our prospects. We offer cloud consulting and training; we regularly engage with prospects that are a good fit for our services, or that download our lead magnets. We ask that question regularly. The answer we get back is usually, "We don't have a cloud project yet, the need is not real. Therefore it's not a priority." The data from the TEKsystems survey reinforces for us that many organizations are ad-hoc by nature. With tight budgets, IT staff juggling multiple projects, and the need to meet other organizational IT support needs, proactive planning and workforce preparation doesn't make it down to IT staff. That is until a cloud project is green-lighted, then it's real, then you have to bring cloud IT skills into your organization. As indicated in the TEKsystems survey, many organizations end up with only 90 days to do that. What are the costs of retraining vs hiring new staff? What are the risks of each approach? We've done the research, download our whitepaper and see. I have one question I leave with many of the prospects we talk to, and it's one you should consider. If you have a major cloud project dropped in your lap tomorrow, could you have your staff ready to start in three months with existing staff? In her article, Ms. Harbert looked how five enterprises chose to bring in the skills necessary to get their cloud projects implemented. The approaches ranged from letting staff upskill themselves, to hiring consultants, to facilitating continuous training to ensure skills were top-notch. Ms. Harbert's article explained how the Financial Industry Regulatory Authority (FINRA) needed to "move market surveillance and regulation operations from an on-premises private data center to a cloud-based, open source-based platform," but didn't have a large training budget. Wanting to use as much existing staff as possible, they "encouraged staff to upskill themselves." From there, "IT staff 'self-selected' into retraining -- those who were curious and ambitious invested in learning new skills and competed for the new jobs (a total of about 500 to 600 positions). Benefits: From our perspective, this approach is, by far, the riskiest. The only real benefit is that it's easy for management because they have effectively punted any real leadership and direction down to their employees. Risks: The risks to this approach a numerous. There's no guarantee what training people will take, how good that training is, or how comprehensive it is. There's no planning for the multitude of skill sets truly required by cloud adoptions, from cloud architecture to security, to compliance, to automation, and orchestration, to sysops, and devops (which can entirely change an organization's approach to the cloud). There's no guarantee of the timeline in which training will take place. There's no mapping of skills required to the cloud project needs. The risks add up to the likelihood of a poor cloud implementation. An implementation that may have security or compliance problems, or that may be poorly architected and unable take full advantage of cloud elasticity, automation, and technology benefits for best performance and cost savings. Ms. Harbert's article was short. Perhaps FINRA laid out timelines, designated which training was approved, and identified skills mix they wanted from employees. However, this seems unlikely because it would have taken a skilled team knowledgeable in cloud to define these requirements. Ms. Harbert also focused on the approach by the Central Pension Fund of the International Union of Operating Engineers, a small non-profit. Gregory Drauch, manager of the program, is worried about security. He has a limited budget and is considering hiring consultants "with the expectation that his staff, working side-by-side with consultants, will learn new skills in the process." Benefits: Vet your vendors well, and there are many. Research your consultants, find one with a good track record and they can help you implement, deploy, and secure your infrastructure very well. Their knowledge and skill will help you get the job started, and done, faster, and help ensure it's done right. Risks: Many consultants are about doing, not training. Consultants will often work closely with your staff, but they aren't specifically on-site to train your staff. They will share their knowledge, and provide configuration recommendations, and reports that staff can learn from. However, this is far from a well-rounded education. That staff will learn a lot about the solution the vendor chose, and why they chose it. They will not necessarily learn about alternative options or all the pros and cons of the implemented solutions. Remember, consultants make more profit the more efficiently they can service requests. Many consultants also have relationships with specific vendors and service providers. The solutions they offer may, or may not be the best solution for your organization. At a minimum, you should have consultants disclose any of those affiliations up front. You should also ask them if they are willing to take extra time to mentor staff. If this approach is attractive to you, and if you can find one, select a consultant that provides training in addition to consulting. Another company profiled was AT&T which is undergoing a "massive workforce retraining program." While AT&T is investing heavily in retraining existing staff. AT&T maintains a "talent profile on each employee, an internal resume that includes any recent or ongoing training. When the company posts new positions, it not only describes the job and skill requirements but includes details designed to encourage training, such as the rate of promotions and the market salaries for such jobs." The goal is to show employees where they should be spending their time if they want to plot their future." Most importantly, "Most training is reimbursed by the company." Employee paid training as a perk. It makes them more marketable inside and outside the company. Employees can plug their career plans into the company's direction, making them feel like they're a part of something bigger that contributes to company success and their own. The company reaps the benefits of new skills. Not all people are great at self-directing their education, or proactively approaching their career growth. Many very good employees, simply don't do it. They want or need to be told when and how to skill up. While this puts these types of employees at a disadvantage, the simple fact remains, providing direction on training and career growth may be a simple way to force good workers to get the skills you need. Even with the strong benefits of this approach, timing is everything. In the 90 days until project launch scenario, identifying new job positions and relying on internal requests for training may not bring the skills into an organization in the required time. In that instance, defining a training program, and its participants may be necessary. Approach 4: Directed, Constant, Training. The approach used by Accenture, detailed in Ms. Harbert's article is unique. First, because Accenture has a large, $800 million dollar training budget. It's also unique because Accenture is an IT consulting firm. Of course, their people need the latest skills and experience because that's what clients will be demanding. That being said, there are benefits to this approach that many companies can realize. Benefits: Get ready for tomorrow today. It's simple, train today for the skills you'll need tomorrow. If every organization did that, they'd have a lot easier time implementing cloud and other next generation IT services. Risks: Budget, leadership, the reality factor. The problems with this approach were detailed at the start of this article. Too many organizations won't allocate training budget for projects that are more than 90 or 180 days out. If your organization can adopt this approach, you should. Employees see training as a perk and value it. Companies reap the benefits of new skills, happier employees, and often see an advantage competing for new employees in an ever constricting pool of talent. Find a training partner, like CarverTC that offers both consulting and training on the cloud technologies. One who only teaches what they do, and who is willing to combine the services. There are many advantages to skilling up your existing IT staff to get ready for cloud projects. These include cost savings over recruitments, retention of institutional knowledge, and happier, more loyal employees. The best time to do this is well in advance of cloud projects, and to start with vendor-neutral cloud training so that your team can evaluate and compare cloud solutions. However, if your organization, like so many, can't be as proactive as it likes about training, and ends up with 90 days to get the skills in-house before cloud projects must start, a strong, focused, and dedicated training partner, like CarverTC, can get your staff skilled up the right way, so your cloud projects get done right, on time, and on budget. In a recent article on Infoworld, David Linthicum asked the question, "Why do cloud projects fail?" The answer he came up with is often "resistance from your colleagues." While there are many technical challenges that can become barriers such as vendor lock in, security, and compliance, cloud project stakeholders are often blindsided by another set of barriers that they don't expect, internal resistance. In this video, we lay out some common problems, and some solutions for managing your organization’s culture to facilitate cloud adoption. To see our full article, click here. CloudMASTER cloud computing classes provide a comprehensive, in-depth, vendor neutral environment that explains critical technological, and cultural barriers to cloud implementation. It also provides hands-on migration planning, management, and automation activities throughout the three courses. Specifically, the Cloud Architect Course dives deep into designing a cloud architecture to meet organization requirements. It also explains the skills, and personalities that make up an effective cloud team. It details the causes behind these cultural barriers and provides strategies for addressing them. Beyond that, the course devotes an entire lesson to presenting a cloud project plan. This lesson covers how to structure your argument, back it up with data, and how to communicate it to executives, peers, key stakeholders, and other staff. CloudMASTER includes this training because it's critical to successfully implementing cloud projects. 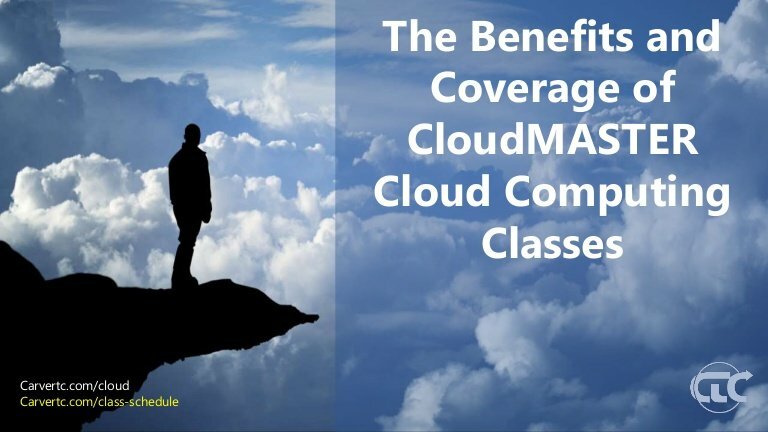 Anyone who takes this course, and the other CloudMASTER classes will be well equipped to overcome the cultural barriers outlined in this article. CarverTC provides CloudMASTER Cloud computing training in Portland Oregon and around the United States. But since people are asking, we wanted to put all the benefits in one easy to consume place so we decided to create this SlideShare. In it, we tell you the platforms, tools, and technologies that you get hands-on experience with. We also show you the skills taught related to SaaS, PaaS, and Iaas. Finally, we show you how the CloudMASTER cloud computing classes address key cloud computing concerns of executives, and key implementation challenges faced by IT pros, and why the classes, and the associated CloudMASTER cloud computing certifications might be a good choice for your organization, or your career. Enjoy! The cloud security topics covered in CloudMASTER training. 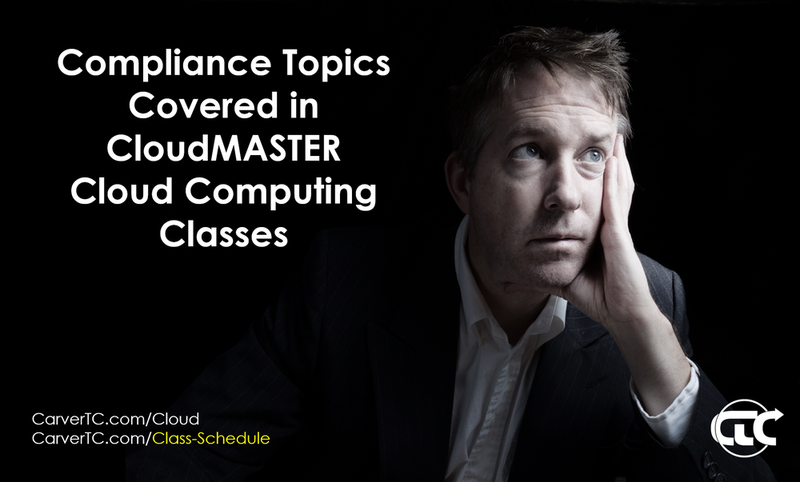 The cloud compliance topics covered in CloudMASTER training. The money you can earn with cloud computing certifications. CarverTC authored the CloudMASTER cloud computing courses with help from the cloud experts at the National Cloud Technologists Association and our great partners at Logical Operations. CarverTC delivers cloud training in the Portland Oregon area, and across North America. Since we added the CloudMASTER cloud computing classes to our class schedule, we've been getting a lot of questions about the CloudMASTER cloud computing certifications. IT pros and IT managers want to know what the different certifications are, how the certifications map to different points in an IT career, as well as how they map to different stages in an organziation's cloud adoption. They also want to know more about the overall CloudMASTER certification track. We've broken it all down for you in a SlideShare. If you want more great content like this, follow the CarverCloud SlideShare channel. Why we added CloudMASTER classed to our schedule. Why CarverTC is the best choice to delivery CloudMASTER classes. The skills and tools covered in cloudmaster training. CarverTC offers CloudMASTER cloud computing classes in the Portland Oregon area, and across North America. Success or failure of a cloud computing project, be it a simple SaaS implementation, or a complex legacy application migration, or anything in between will hinge on the technical knowledge, skills, and training of your IT staff. What many CIOs and aspiring cloud project managers don't realize is that winning approval to even start a cloud project can be one of the most difficult cloud computing tasks. Further complicating this is the fact that technical knowledge is not the most valuable asset in overcoming this cloud challenge. How you present the project, how you sell it, is the secret sauce for getting cloud projects approved. In this article we'll break down the issues, how sales and presentation skills help, and give you strategies to start honing those skills so that you can get approval for your next cloud project. There are many challenges and concerns about migrating services, applications, and infrastructure to the cloud. From cloud service vendor lock in, to security concerns, to compliance needs, to internal and cultural resistance. These challenges must be, and can be, addressed by thoughtful planning and application of technologies in any cloud migration. Invariably, as with any change, the voices of concern will rise up to get their concerns addressed as cloud projects are considered. Some may see the value of the cloud, and simply seek the best solution to address their concerns. Others may be apprehensive and will council a more cautious approach that seeks to delay cloud adoption. For all the numerous benefits of the cloud, executives and key decision makers will likely hear lot of reasons to be cautious, a lot of reasons to "not migrate today." If you don't properly address those concerns, those attitudes could prevail and keep cloud projects from being green-lighted. For all the numerous benefits of the cloud, executives and key decision makers will likely hear lot of reasons to be cautious, a lot of reasons to "not migrate today." If you don't properly address those concerns, those attitudes could prevail and keep cloud projects from being green-lighted. This is where sales skills come in. You should approach any cloud project from a consultants perspective. You should come in with the objective of selling key stakeholders, senior leadership, and the entire organization on the value, benefits, and plan for moving to the cloud. This is not an easy task. Cloud consultancies like CarverTC put a lot of time and thought into preparing cloud consulting proposals for a reason. It takes time to identify all of the concerns, and develop plans to address all of the challenges. Once you have a plan, you have to articulate it the right way to several different audiences. This is where presentation skills and sales training come into play. One of the first key components of any successful cloud project is the team you put into place. Team members should include key technical resources, and key stakeholders. These people are key to identifying the challenges the organization will face in the coming cloud project, as well as the the concerns and resistance that will come forward in meetings at the final project presentation. Having a team that is knowledgeable about departmental requirements, mission critical processes, and that is plugged into organization culture is key to identifying challenges so that they can be appropriately addressed in the cloud project plan. As a plan is prepared, discussions will happen throughout the organization. Approaching those discussions with a selling attitude will help frame a cloud project in terms of benefits, and will often go a long way toward winning over concerned parties. However, in many cases, cloud projects can live or die based on a presentation that is delivered to executives and stakeholders. A presentation that will have to show the vision, the value, answer questions, and address concerns. This presentation may have to be delivered multiple times, at various project milestones. It will need to be successful in order for the project to be green-lighted to go to the next phase. At each presentation, challenges and concerns, often the same concerns addressed previously, will have to be addressed again to provide decision makers with the assurance that the team is on top of it, and the challenges will be handled. More importantly, at each presentation, the value of the cloud project, the cost-benefit to the organization, in terms of real, relevant goals and priorities will have to be articulated. Remember, if the cloud is new, it's an unknown. For many executives it's always safest to stay with a known entity rather than move down a new, unknown path. The presentation has to give decision makers the confidence, in the team, and in the plan, and in the ultimate benefit to the organization to compel them to move forward. The format of the presentation is critical. A poorly crafted presentation, weighted down by mounds of technical detail that isn't suited for executive consumption. That type of presentation invites debate while leaving key messages out of focus. It's a recipe for failure. A well crafted presentation, on the other hand, where key points are made, supported, and restated quickly and concisely will capture executives attention and imagination. A presentation that uses all elements, from font size, to images, to colors to compel the desired conclusion, a presentation that is designed to sell the project, will have much more success in the boardroom. Another key presentation skill is delivering the presentation. That means knowing how to communicate to executives. Executives are busy people. They don't want to get caught up in the details. They want you to get to the point. This type of communication is difficult to master because, working with peers, detailed discussion is how you address problems and find solutions. Executives don't want this. Not at the time of the presentation. If the presentation is well done, and well delivered, they will trust the cloud project team to address those details. To give decision makers confidence, you will need to be prepared to defend your assertions and recommendations. You need to have responses ready to address concerns and criticisms. Thoughtful preparation, combined with a communication style that resonates with executives. It will help you cut through the chatter, make your points, and win project approval. You, and your project team need to be the smartest people in the room, and deliver you plan, clearly, quickly, and concisely. One of the many things we're proud of in the CloudMASTER cloud computing classes is the emphasis we put on preparing the project team, discovery and requirements documentation, and presenting your cloud project plan. The architecture course devotes an entire lesson to assembling a good cloud project team, and documenting everything for a presentation. At the end of the course, another entire lesson is devoted to creating and delivering that presentation. We've found no other course that covers this essential step so thoroughly. This course not only teaches the fundamental presentation skills to help you create a presentation that will compel action, but also teaches the skills essential for communicating with executives. The course activities provide a structure to let you do a "dry run" of your cloud project presentation. This focus, combined with the technical planning, and design skills conveyed in this IT training, give students an unparalleled advantage in the workplace in getting cloud projects approved, or winning cloud consulting engagements for their company. It's just one more great reason to invest in CloudMASTER cloud computing certification. CarverTC provides CloudMASTER cloud computing training in Portland Oregon and across North America. In a recent article on Infoworld, David Linthicum asked the question, "Why do cloud projects fail?" The answer he came up with is often "resistance from your colleagues." While there are many technical challenges that can become barriers such as vendor lock in, security, and compliance, cloud project stakeholders are often blindsided by another set of barriers that they don't expect, internal resistance. There are lots of changes that must take place when an organization moves to the cloud. Changes in software, changes in service, changes in escalation, the list goes on. The scope of these changes, coupled with an organization's existing culture, can create internal resistance to cloud adoption that is difficult to overcome. The issues surrounding internal resistance must be carefully, and thoughtfully, managed to ensure they don’t stop cloud projects before they start. In this article we’ll lay out some common problems, and some solutions for managing your organization’s culture to facilitate cloud adoption. In addition to that adjustment, IT staff will need new skills. These range from learning the user interfaces, APIs, and scripts of cloud service providers, to managing cloud vendors to make sure service level agreement obligations are met, to monitoring and optimizing cloud solutions using vendor and third-party tools. These skills go beyond what has traditionally been expected of IT staff. There will be a learning curve, and IT staff will have to step out of their comfort zone. Some IT staff may like their new job requirements, while others may feel they are being replaced by the cloud. IT managers and CIOs may resist the cloud for entirely different reasons. Managers may feel that they know how to solve problems in their current environment. They can replace a server, recover data from a backup, add capacity to that database, and so on. Moving to cloud services may move them out of their comfort zone. Some industry experts are predicting cloud services will greatly diminish the responsibilities and position of the CIO. Naturally, this can create resistance. What is shadow IT? Shadow IT services are departments that have individuals, often called power users, department IT helpers, or someone else who provides critical IT or application support to the department. They may work closely with regular IT staff or be nearly independent. In some cases these shadow IT staff are the only real IT experts for specific systems, applications or integrations critical to a department's operations. Departments put shadow IT staff in place to gain more control over critical systems, or to get more responsive IT support. They won't want to give these things up for a move to the cloud without assurances that they can get similar access and service once services and applications are moved to the cloud. Again, any issues like this in an organization must be identified, and addressed thoughtfully. Moving to the cloud will be a shift, not only for technologies and IT staff, but also for all employees in the organization who will access and use cloud-based solutions. While you can make the argument that employees shouldn't care where their IT services and applications come from, they often do. They are used to, knowledgeable with, and even may like the their current applications, and how they access systems and data. Some of that will likely change when services, data, and applications are moved to the cloud. Again, those issues need to be identified, and thoughtfully examined and messaged. "People demand that you get their approval and then don’t show up to meetings. Budget dollars are removed that were initially earmarked for the cloud. And, my favorite, some people go to company leadership to scare them to death about the imaginary threats that cloud computing will bring. The resistance is often pretty passive aggressive." The result? Cloud projects may be delayed at many different points, may have scope and budget reduced, or may be stopped altogether. Beyond that, failure to address internal IT resistance, and old IT habits can result in implementations that don't take full advantage of the automation available in the cloud. In a Network Computing video, Joe Emison, CTO of BuildFax, points out that many organizations create problems for themselves by not appropriately identifying a move to the cloud as something that requires a full rethink of long standing IT and development processes and procedures. The desire to keep system provisioning, application deployment, and maintenance "hands on" reduces efficiency. It can hamper some of the main advantages of cloud deployments such as rapid elasticity. Communication is certainly key throughout the life of any cloud project, from conception, to pilot, to proof of concept, to implementation. But what do you communicate, and how do you communicate it? Cloud project leaders will have to communicate with C-Level executives, subordinate IT staff, key department heads, and employees. Each of these groups requires a different communication approach. On top of that the cloud team will have to provide updates to all employees as cloud projects move into implementation and deployment. While we're asking questions, who should be on the cloud project team to give cloud projects the best chance for overcoming both technical and cultural challenges at an organization? "A lack of understanding is at the root of the insecurity some people experience, and the (passive) aggression that results. A bit of knowledge will soften up the people who are on the fence about cloud computing. Once that happens, things will go a lot smoother because you'll have the crowd's momentum on your side." For companies considering moving to the cloud, one of the biggest concerns is remaining compliant in the cloud. In some cases, it's enough of a concern to delay cloud migration, or stop cloud projects altogether. Fortunately, compliance is a major concern for both cloud vendors as well as regulated organizations. Many cloud providers have gotten certifications proving they have compliance friendly processes and meet compliance standards. Others have made serving certain compliance related markets their niche. No matter what your approach, you should be well educated about the variety of compliance issues surrounding moving your data to the cloud. It's about more than finding a compliant provider. You have to assess how a provider will respond during an audit, or if an data breach occurs. The CloudMASTER cloud computing classes on our class schedule discuss all of these compliance issues in detail. To make it easy for you, we put the compliance topics covered into an infographic. Enjoy. CarverTC provides CloudMASTER cloud computing training in Portland Oregon and across the United States. Moving to the cloud, or already there and have questions? Reach out for a free consultation at cloud@carvertc.com.